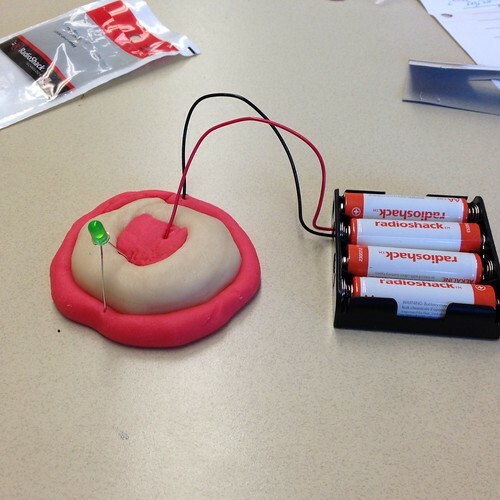 Squishy Circuits: Review and Trial! I’ve been reluctant to play around with electricity in the Design Lab, because it’s not my area of expertise. Why reluctance? It’s not like Design Labs make electronic products these days. They’re more like TinkerLabs, that teach kids and adults how to fiddle with things until they work. And that requires delving into issues which are not one’s area of expertise. So why the reticence? I’ve been reluctant to bring electricity and electronics to the Design Lab/MakerLab at my school because I’m fearful of the costs. It’s an important part of the Maker culture these days, but it’s not something I know much about. A friend of mine gave us a lot of parts and materials, everything from breadboards and wiring, to diodes and resistors and logic gates. And I have no idea how to use any of it. And if/when a group of kids breaks it, I have no idea how to replace, repair or refurbish it to make it available to the next generation of kids. But it’s always time to learn something new. 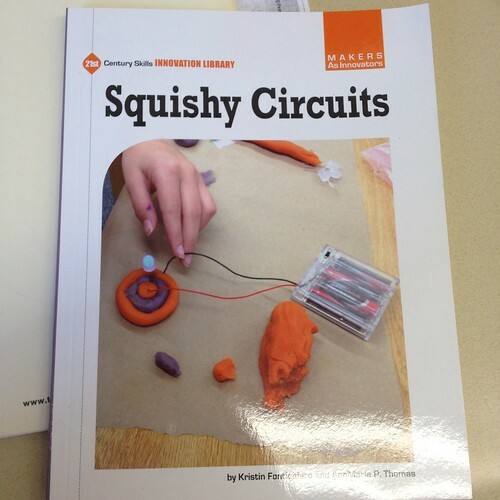 So, I bought a copy of Squishy Circuits by Kristin Fontichiaro and AnnMarie P. Thomas (Amazon|Powell’s). And, today, I was able to test the conductive dough and the insulating dough with a couple of elements from RadioShack. I’m pleased to say that this works, and that I already know a LOT more about electricity than I knew twenty minutes ago, and I have a better grasp on how to explain it to kids and adults. Best of all, from my perspective, is that four of my colleagues came in, and I worked with them for about twenty minutes, playing with batteries and the two kinds of dough and a few LEDs and a small 1.5v motor. Now, all of us know how to make a squishy circuit. And this is how you make knowledge of design thinking spread… by teaching small, specific skills, in casual contexts, and making discoveries about how this technology stuff works. Now, for the book review. This is a small volume. It’s thirty-two pages start to end, including a glossary of basic electronics terms, a bibliography and a list of web resources. There are a lot of pictures, and it’s written at a level so that parents and kids can both read it together. AnnMarie and Kristin do a good job of explaining how the dough works, and a little bit of why. There are two doughs recipes in the book — one cooked and conducting (mine is red in the picture above) while the other is uncooked and insulating (white/uncolored in the example picture above). The insulating dough is heavy with sugar, while the conducting dough is heavy with lemon juice or cream of tartar — leading to the designations Sweet for insulating, and Sour for conducting dough — which can spark some useful conversations about how batteries are built. There’s a couple of advanced projects in the book, but basically this is a starter kit and not much more. All the same, it’s an elegant starter kit, and it’s gotten me off to a good start in terms of learning how to begin teaching about electronic circuits. This was a big gap in my knowledge base as the leader of the Design Lab, and I’m pleased to say that this got me started on learning more, even more than my initial foray into soldering. I now have a better sense of volts and amperage (which this book does not teach, but it concretized what I’d already read). And I imagine that a kid who does some of these exercises will be in a good position to understand what they’re taught about electricity later on. Overall, the book earns the Watt Wonders seal of approval, Silver level. 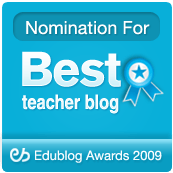 There aren’t quite enough activities to make this more than a few hours’ play for a family with a kid, although the online exercises it links to are interesting and substantial. There’s definitely capacity to grow beyond this, though. More than that, Squishy Circuits is part of a larger series of books, which include volumes about Makerspaces, Soldering, 3D Modeling and 3D Printing, Arduino, and Raspberry Pi. I think that I’ll be ordering more books form this series for our future programs at this school.